Thank You for Helping Us Raise $82,000! Last year was a monumental year: Our chapter turned 30, we celebrated the 50 best works in our area, and our parent organization turned 100 years old. 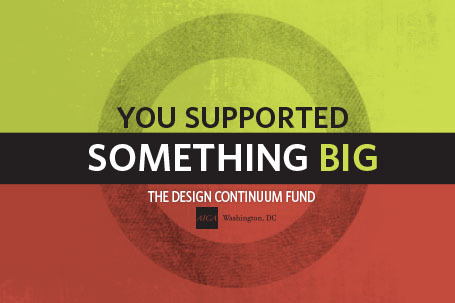 The Design Continuum Fund, AIGA DC’s annual scholarship that provides financial assistance and mentoring to talented local students pursuing art and design education, had an eventful year too! Through endless engagement, event production and fundraising, the Fund received $50,000 in donations (the most ever raised in a single year in part due to the 10 for 30 campaign) bringing the total amount raised to $82,000! This success could not have been achieved without the support of the AIGA DC board, the Design Continuum Fund committee, AIGA national board members, friends and YOU! We’d like to thank you for your ongoing support and hope that you will join us in taking a look back at the Design Continuum Fund’s highlights! So what’s next for the Design Continuum Fund? Now that we have $82,000 stored away, we’ll be implementing an endowment that will allow us to create a more sustainable scholarship program. We will likely be able to give out more scholarships and decrease the pressure on year-round fundraising. In creating this scholarship, we always had our sights set on building a lasting legacy, and this is a huge step. We’ll also continue to mentor our recipients, folding them into our AIGA family and acting as a valuable resource to them throughout their education. Supporting the future of design is key, and we have a vested interest in ensuring that those behind us can carry the torch. Again, we are deeply grateful for your support and the fact that you are part of our family! Please stay in touch and follow us through our various social-media platforms for updates. If you’d like to help support a student, visit our donate page. Home News Thank You for Helping Us Raise $82,000!